Written by Olivier Gagliardini on 25 October 2018 . Over recent decades, Greenland ice sheet surface melt has shown an increase both in intensity and spatial extent. Part of this water probably reaches the bed and can enhance glacier speed, advecting a larger volume of ice into the ablation area. In the context of a warming climate, this mechanism could contribute to the future rate of thinning and retreat of land-terminating glaciers of Greenland. These changes in ice flow conditions will in turn influence surface crevassing and thus the ability of water to reach the bed at higher elevations. Here, using a coupled basal hydrology and prognostic ice flow model, the evolution of a Greenland-type glacier subject to increasing surface melt is studied over a few decades. For different scenarios of surface melt increase over the next decades, the evolution of crevassed areas and the ability of water to reach the bed is inferred. Our results indicate that the currently observed crevasse distribution is likely to extend further upstream which will allow water to reach the bed at higher elevations. This will lead to an increase in ice flux into the ablation area which, in turn, accelerates the mass loss of land-terminating glaciers. Written by Olivier Gagliardini on 10 September 2018 . In north-western Tibet near lake Aru Co, the entire ablation areas of two glaciers (Aru-1 and Aru-2) suddenly collapsed on 17 July and 21 September 2016. The masses transformed into ice avalanches with volumes of 68 and 83×106m3 and ran out up to 7km in horizontal distance, killing nine people. The only similar event currently documented is the 130×106m3 Kolka Glacier rock and ice avalanche of 2002 (Caucasus Mountains). Using climatic reanalysis, remote sensing, and three-dimensional thermo-mechanical modelling, we reconstructed the Aru glaciers' thermal regimes, thicknesses, velocities, basal shear stresses, and ice damage prior to the collapse in detail. 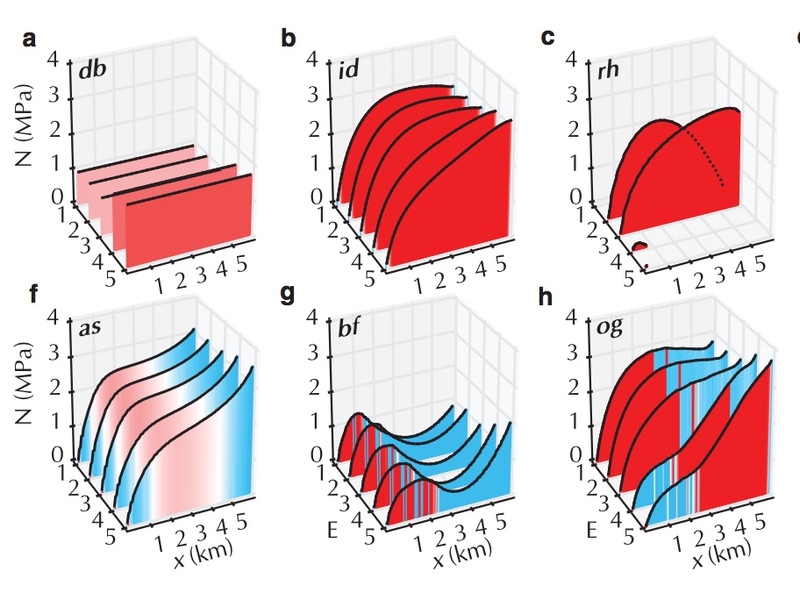 Thereby, we highlight the potential of using emergence velocities to constrain basal friction in mountain glacier models. We show that the frictional change leading to the Aru collapses occurred in the temperate areas of the polythermal glaciers and is not related to a rapid thawing of cold-based ice. The two glaciers experienced a similar stress transfer from predominant basal drag towards predominant lateral shearing in the detachment areas and during the 5–6 years before the collapses. A high-friction patch is found under the Aru-2 glacier tongue, but not under the Aru-1 glacier. This difference led to disparate behaviour of both glaciers, making the development of the instability more visible for the Aru-1 glacier through enhanced crevassing and terminus advance over a longer period. In comparison, these signs were observable only over a few days to weeks (crevasses) or were absent (advance) for the Aru-2 glacier. Field investigations reveal that those two glaciers were underlain by soft, highly erodible, and fine-grained sedimentary lithologies. 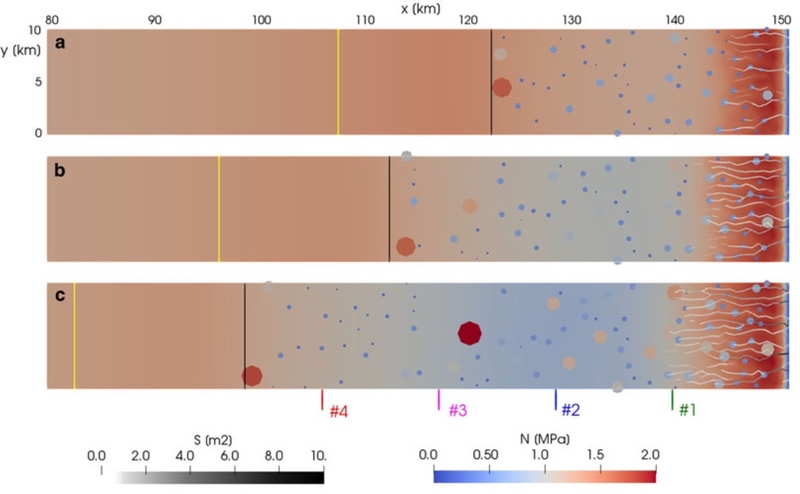 We propose that the specific bedrock lithology played a key role in the two Tibet and the Caucasus Mountains giant glacier collapses documented to date by producing low bed roughness and large amounts of till, rich in clay and silt with a low friction angle. The twin 2016 Aru collapses would thus have been driven by a failing basal substrate linked to increasing pore water pressure in the subglacial drainage system in response to increases in surface melting and rain during the 5–6 years preceding the collapse dates. Read more: Gilbert A., S. Leinss, J. Kargel, A. Kääb, S. Gascoin, G. Leonard, E. Berthier, A. Karki and T. Yao, 2018. 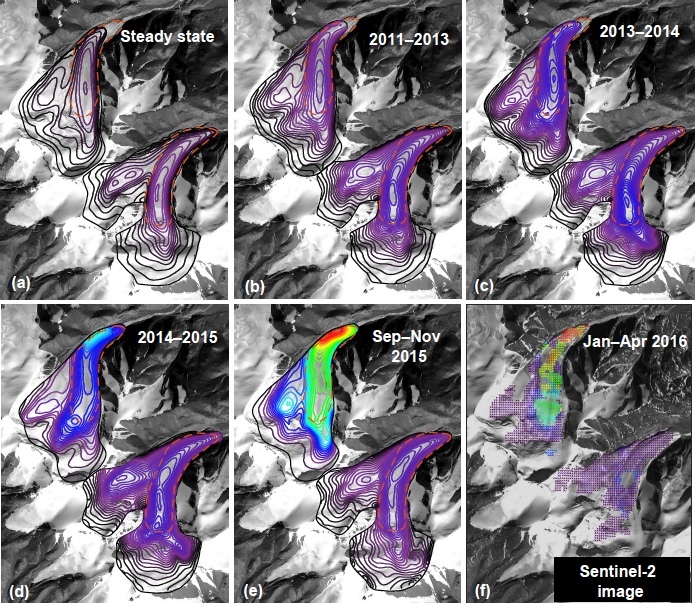 Mechanisms leading to the 2016 giant twin glacier collapses, Aru Range, Tibet, The Cryosphere, 12, 2883-2900, doi:10.5194/tc-12-2883-2018. Written by Olivier Gagliardini on 26 August 2018 . O ver recent decades, Greenland ice sheet surface melt has shown an increase both in intensity and spatial extent. Part of this water probably reaches the bed and can enhance glacier speed, advecting a larger volume of ice into the ablation area. In the context of a warming climate, this mechanism could contribute to the future rate of thinning and retreat of land-terminating glaciers of Greenland. These changes in ice flow conditions will in turn influence surface crevassing and thus the ability of water to reach the bed at higher elevations. Here, using a coupled basal hydrology and prognostic ice flow model, the evolution of a Greenland-type glacier subject to increasing surface melt is studied over a few decades. For different scenarios of surface melt increase over the next decades, the evolution of crevassed areas and the ability of water to reach the bed is inferred. Our results indicate that the currently observed crevasse distribution is likely to extend further upstream which will allow water to reach the bed at higher elevations. This will lead to an increase in ice flux into the ablation area which, in turn, accelerates the mass loss of land-terminating glaciers. Read more: Gagliardini O. and M. Werder, 2018. Influence of increasing surface melt over decadal timescales on land-terminating Greenland-type outlet glaciers, Journal of Glaciology, 1-11, doi:10.1017/jog.2018.59.